Robin: Holy Smokes Batman � you mean I might have missed a few really good motorcycle B-Movies? Batman: Fear not Robin, unless you get sick and stay at home like I do when I'm sick, you're sure to miss a good B-movie or two. It's true folks. Hundreds, if not thousands of motorcycle b-movies were shot between the 40s and now. You know some of the names. Angels from Hell, The Road Warrior and Black Bikers from Hell. In fact, if you look through the pages of history, Jack Nicholson made an early career making bad biker b-movies until he got high with Dennis Hopper one weekend and conceived the screenplay for Easy Rider � which is also just a lousy biker b-movie in itself really� don't ya think? In the late 60s and early 70s, filmmaker Bruce Brown was running around shooting sports action for Sport Illustrated magazine. During that period he used the same team to produce Endless S ummer, a surfing movie, and On Any Sunday, a motorcycle movie. 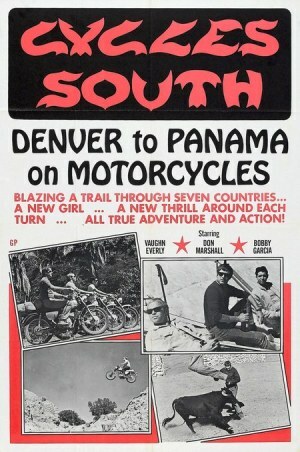 Interestingly enough, there was another adventure motorcycle movie being filmed at the same time as On Any Sunday. Turns out a few riders from Colorado were working in the same realm, only this time, it was creating an amalgamation of Bruce's work unbeknownst to them. They took the journeyman essence of Endless Summer and combined i t with an adventure riding epic to create Cycles South. For this film , three riders travel from Colorado to Panama. Sometimes on-road, sometimes off. When they hit the border they trade in their less-than-worthy bikes for a trio of Kawasakis and continue the journey south all the way to Panama. Along the way they traverse railroad tracks, swamps and plenty of places where no one has ridden and probably will never ride a motorcycle again. With bungeed - on duffle bags, they make Charlie and Ewen look like babes in the woods of adventure travel. It probably qualifies as a b-movie because it's very cheesy in some parts, but the cinematography is awesome for that time period and considering the obstacles during the range of travel. Film Man Don Marshall was along for the ride the entire time shooting great footage. He eventually went to to work on TV shows like The Police Story, Vegas and The A-Team. Cheesy , right. But cheesy won't cut it if you can't shoot film in the first place. Cheese, Cheese, Cheese! - At its finest. Take a writing team like Ivan and Sam Raimi (Xena, Drag Me To Hell, Spiderman 3) and put them together with a soap star like Eileen Davidson and you've got all the makings for a parody on old biker b-movies. Maybe it's the caf� scene where Wendy (Marjorie Bransfield) stuffs her boss' hands into the waffle iron; maybe it's when Bruce (Paul Le Mat) succumbs to She Wolf's (Davidson) desires and she howls like a wolf. It's hard to say where to begin with the best parts of this flick. But folks, if you were looking for a Harley-Davidson, you'll only get half that with Davidson, because the bikes they ride are all Japanese customs from that era. Cheese, Cheese, Cheese. Now we don't want to break your hearts here, but neither of these movies has ever been released on DVD!! I know, it's a pathetic shame. But for a limited time only you may find these being featured as "FREE" movies on your local cable channel. The day I watched them I caught them both in HD. Catch 'em before they disappear into oblivion. Just remember - when you're home sick, life don't have to be so bad.